Learn how to build your English fluency team in episode 11 of the Power Learning Podcast! In this episode of the Power Learning Podcast, I discuss the importance of building a team to help you become a fantastic English speaker quickly. Enjoy this Power Learning Podcast episode, and let us know what you think in the comments! Well hello, and welcome to episode 11 of the Englishanyone.com Power Learning Podcast. I’m Drew Badger, author, English-speaking confidence expert, and co-founder of Englishanyone.com. And I’m excited as always to welcome you to the program today. Well I have a special treat, as always I really like to give fantastic content. I’m so excited to help people. Again I always tell the same story, but it’s because I went through the same problems uh, and the same struggles when I was learning to get fluent in Japanese. So now all of the things that I learned and continue to learn are the things that I want to share with you, so it becomes much, much easier to attain your goals and become a fantastic speaker. Just one word before we begin today. I really want to make it clear that basically what I do, it’s not really so much about teaching verbs, or adjectives, or phrases or anything like that. It’s more about getting you to experience what it’s like to be a fantastic speaker. And that’s really, really what I want you to, to get to. That’s the real goal, because it’s not about achieving a certain test score, even though that might be something you’re after. That’s something that you’re interested in having. The real thing that you’re after is being able to have a fantastic conversation with people, to know how to begin conversations with confidence, to know how to listen for the keywords in conversations so that even if you don’t understand everything you can pretty much get the point. And then you can have really great deep meaningful conversations with people, and then not just have it stop at introductions. I get lots of questions uh, and requests for students about how do I have better conversations with people? Because I notice a lot of times people are kind of looking in the wrong way, and that’s why right now I’m working on a fantastic really full guide that’s packed with a lot of information that will help students get out and meet lots of native speakers to practice with. But just remember that the ultimate goal here, it’s really, it’s not arriving at a specific thing like a good test score. It’s all about being able to become the person that can have fantastic conversations with people with confidence. And that’s really what I do here. So today we’re going to move a little bit closer as we’ve been every month with our Master English Conversation Scholarship winners. And I really want to talk about, because we’re getting closer to more specific things, more about getting out and actually practicing. We’re moving closer to tactics, again tactics are the kinds of specific tools or things that you have to do in order to become a better speaker. When we first began, if you’ll remember, if you’ve been following along over this year with our Master English Conversation Scholarship winners they’ve been going from the more general ideas about how to think, kind of the psychology behind how to become a great speaker, and how to build confidence. And now we’re getting more and more into how do you actually get out and practice with native speakers. So today I want to continue with that. We’re going to talk a lot about that, and it’s kind of a little bit different than maybe something you’re used to as a learner. Because many people spend so much time kind of being an individual person as a learner. And especially if you’re learning another language, and there isn’t anyone else around you that’s also learning the language it can be kind of a lonely thing. And I know even if you get out and you can meet other people to practice with it can still be kind of an individual experience. And I want you to start thinking about it in a different way. So we’re going to talk about that in this episode of the Power Learning Podcast. So let’s jump right into it. So what I want to talk about today is building a fluency team, building a fluency team. And before we talk about that I’ll, I’ll give kind of uh, a few examples from business so you can see really how this works. When I was first getting started in business and a lot of people kind of uh, a lot of entrepreneurs they go through this same kind of period where it’s really lonely, really frustrating. Uh, and they don’t really know what to do. And they really want to meet people, but they don’t really know how to do it. And they feel alone, and it can be kind of difficult like that. And it’s especially the same thing for people that are living in different countries, and they don’t know how to meet native speakers. And they want to improve but they just don’t know how. But one of the things that a lot of people do when they begin learning about business, and this is the same thing I did, is I’m trying to figure out how to do everything on my own. I want to, you know, just in, in the example of me designing my book and creating that uh, I went out and figured out okay, how do I even draw the pictures? I didn’t know how to draw the pictures. I knew how to draw kind of uh, pretty well I guess. But the specific kind of images I wanted to make for Japanese children uh, this was a very specific style of drawing that I had no idea how to do. So I actually instead of finding somebody else to do it, I went out and started looking for books that would teach me how to do that. And I found books for lots of different things. I found books even on Photoshop, and learning how to design things on the computer. And I spent all this time learning how to do things by myself instead of working with other people. Now I know that it can be especially for starting businesses, where you just don’t really have the money to spend on things. So you have to begin starting a business or creating things by doing all of the work yourself. But I really want you to change the way you think about that, especially if you are thinking about doing things by yourself and you’re learning by yourself. Uh, so a few more examples from business. Uh, one of the books that I read when I was growing up uh, was Rich Dad, Poor Dad by Robert Kiyosaki. Uh, and he talked a lot about having a team, because business is a team sport. And the people that succeed in business are the ones that can get a really good team. You have your accountant. Uh, you even have like a marketing person, and sales, and all these other things. And it’s really difficult to see that in the beginning when you’re first starting a business. But those are the kinds of things that you need to create when you’re first learning how to do something. Because you can’t do it all by yourself, and uh, and you can’t possibly become an expert at all of the different things you need to become an expert at in order to get fluent. And the other thing that I’ll mention about this is that while you’re building your team you need to have a wide variety of people that you work with. So people that are good at some things in the business example, you would have an accountant. Uh, you would have somebody else that can teach you about sales and marketing. Because each of those people is going to be good or helpful with that specific thing. So learning a language is the exact same thing. You’re going to find some teachers like myself, so I focus a lot on psychology and how to build confidence. So you can actually get out and speak, but there are other people that are really, really great with grammar. They know all of the rules, and they can tell you everything if that’s what you’re interested in learning. Uh, and there is other people that specifically focus on pronouncing things in a certain way. So there is lots of different people, and you can’t even get everything just from me. So I always recommend even to my private students that they’re learning some things from me, but they really need to start building a team of people that they’re going to work with. And again a team is a great thing because a lot of people just depend on one teacher for a lot of their information. They go out and uh, especially me like in my, my kind of learning about business, my journey for that uh, there was one person in particular that I was starting to learn from. Uh, and this person was really, really great with marketing, just knew so much about marketing, very, very smart person when it came to marketing. But uh, and I was able to learn a lot about marketing from this person. But uh, they were really bad with customer service. And so when I’m kind of learning from that it’s uh, it’s kind of almost like uh, being a young person. And you look up, you admire your parents. And you don’t really think there is anything wrong with them when you’re very young. They might have problems, but it’s not really something you think about. Uh, and you look at your parents, and you want to envision them as having, they’re kind of perfect in a way. And as soon as you get older and you see that they have problems or they make mistakes it kind of changes the way you think about them. And you stop wanting to listen to them about some things because maybe they’re wrong about others. So it, it kind of shatters your confidence a little bit about how you deal with them, even if your parents are fantastic people as mine are. Everybody makes mistakes, and that’s just something you learn as you get older. So if you have one really great teacher uh, even if you think I’m a fantastic teacher, you really need to find other people. Because I may say something or do something, and maybe you’ll disagree. You think, oh that, well that technique is kind of weird, or, or this other thing over here doesn’t make any sense. So we have an English expression that says don’t throw the baby out with the bath water. This is having a uh, like a tub full of bath water, and as you throw all of the water out or you get rid of the water you throw the baby out as well. So maybe you find something that a teacher says, and you disagree with it. So you, you disregard or you throw away everything that that person is saying, and that’s what I don’t want you to do. So this is a lesson I’ve learned. Again this individual that I was learning marketing from, I realized that even though that person doesn’t understand customer service so well or really how to deal with people that, that, that nice touch that you need as, as an uh, as like a leader or a business owner. Even though he didn’t have that skill or understand that perfectly, I could learn a lot from him about marketing. So there are things like that, that I want you to think about. So number one, you really need to build your team, and number two remember that having an individual person, no matter how fantastic they may be it’s always a good idea to find lots of other people to learn things from. So this is uh, particularly important for people learning, because uh, something like learning a language it requires other people around you to help motivate you. It also requires people that can teach you, and sometimes they can be different people. Uh, so it’s uh, it’s a great idea to find lots of different people to learn from, but the important things is that you have diversity there. So not just different people, but different kinds of people that can teach you different kinds of things. And as you work to build your team you can think a lot about what kind of person you want to become, or what kind of speaker you want to become. So understanding that you need the team is one thing, but the second thing is kind of designing uh, because you are the captain. You are the, you are the leader. You are kind of the entrepreneur or the, the president uh, whatever you want to call it, of your own fluency, of your own mind. So your goal is to figure out what exactly it is you want, and you’ve probably heard me say this before if you’ve been following me for a long time. Uh, I’m always, always, always talking about strategy and thinking about what you want first. And you have to be as specific and detailed about it as possible. That way when you’re really thinking about what you want it becomes much easier to get it. So in this case you have to decide not only what kind of English you want to learn, or what kind of English you want to speak, but why you’re learning it. And you have to think about the kind of life you’d like to have. So right now uh, we’ll talk about just the kind of life you’d like to have. For me in thinking about my own Japanese fluency or about business, anything like that, I think about my day to day life as going out and helping lots of people. And spending time with friends, and I get to maybe play a little bit of basketball in the morning or something like that. But I think about my day to day life, not kind of big goals and, and, and those kind of things because those really get you more thinking about like a specific end that you want to have, like passing a test. So I really want you to think now, not about getting a specific thing, but the kind of experiences you want to have. And the kind of experiences that you would have continuously. So when I get students thinking about, and this is for, and you know, the personal students that I work with. But for everybody as well when I speak with them, is to not think about kind of like what you want like in five years as, as like that’s like the specific goal. Even though that’s important, but you want to think about what, what things are like in five years on a day to day basis. And the distinction here is really important, because if you just think about five years as an end or even two years, or ten weeks, or whatever the time is, you’re thinking about getting a specific thing. So as an example if you want to have a lot of money maybe you’re just thinking about your goal being a nice house or a nice car. And you’re thinking about having that specific thing, but it’s, it’s not really what you want. Or at least for most people it’s not, you’re interested in the experience that you get from that thing. And you want it to continue, and to enjoy uh, kind of to be able to enjoy that experience continuously. So you might you know, buy a new house or a new car, and you’ll enjoy that for a little while. And maybe people will look at you differently, and you’ll think about things in that way. But what you really need to be focusing on is the kind of experiences that you’d like to have and how you can have those repeatedly. So I want you to think for the future for you getting fluent right now, think about what’s your day to day life like? And uh, you can begin creating that now, and the more specific you become the faster you will get that, and the easier it will be uh, kind of become for you to get that. So think about what your day to day English speaking life is like. Are you getting on Skype and meeting people? Or are you actually living in an English speaking country, and you can get out and speak with people that way? Whatever the, the situation is, think about that. So don’t think about having, like being fluent. Like that, that’s just not a specific enough goal for you. You really need to think about what your life is like on a day to day basis. And that will help you not only think about the goals you want, but the kind of English you want to speak. So if you really like America, and you want to live in America, or even if you don’t need to live in America, you just like English speakers from America, then that will change the way you study. So always begin with the end, always think about what you want. And then as you decide what your goals are that will help you build your fluency team so that you can meet the right kind of people to learn from. And even if you don’t actually meet them, and like let’s say you never meet some person that you really like listening to, like a famous actor. But knowing that you want to have a voice like that, that will change the way you study. So maybe some of your day to day life activity is reviewing the movies of a particular person that you like. So you know, whatever that thing is you need to start thinking about those things, and then creating the team that’s going to bring you there. Now this team it can be books. It can be audios. It can be videos. It can be real people that you interact with. It’s all of these things, but unless you know what you want and what your specific goals are, again what your day to day life is like, you won’t have a really good idea about how to get there. And I always tell students that it’s not about kind of learning, or I guess the better way to say it would be if you want to learn a specific kind of English you need to spend time around that kind of English and build a team of people that’s supporting that kind of English. So if you just kind of watch children’s cartoons all day, but you’re supposed to be learning business English or something like that, what you’re doing is not in agreement. It’s not aligned with what your goals are. So you need to align those, you need to get them working together, so that you’re really enjoying your learning and you’re making lots of progress. So let’s say uh, I want to learn a lot about business English. I always recommend that students don’t focus on you know, getting a book that’s going to teach them specific words of phrases for the office place because that’s just not a great way to connect with the language. You’re probably going to be quite bored learning that way. And the more efficient approach because you need to have that emotional connection, and you need to remember things through stories, you need to find people and books and other things that are going to help you learn that business English in context. And that means meeting other people who are also learning about business, reading business books, actual, like the actual business books that native English speakers learn with. Because those are the ideas that come into regular business conversations, and then you will have that information as well. Again you have to be specific about this. And I always, I, I get this from students every day when I ask people, okay what are your goals, what are you interested in? And I know it’s not the sexiest thing. People really want a specific how to kind of information. They, they really want to know, okay, how do I get fluent? Where do I learn these words? How do I do these other things? And I always answer them with the same thing, is what do you want? Because the answer and the way that you do your situation will depend on what it is you want. And it will be different from what other people want to do. So you have to think about all those things. Begin with the end as always, think about what you want, and really focus on building a team of people, and again it doesn’t have to be actual people. It can be books, and audios, and other things like that. And you can find really great pieces of information from one person that will help build one part of your fluency. And then you will get other pieces from other people. So remember that the, the two big things about a, about building a team, you want to have that diversity uh, because you don’t want to have just one person you’re learning from. But also it’s just a really good idea to be learning from many different people, because you’ll get lots of new ideas, lots of great insights and help in, in ways that you never thought possible. So begin with your idea, decide what you want, and be really specific about that. Think about the day to day life you’d like to have, and then you can design your team and your studying around that. You can find people that will help you with grammar. If you want to, to work on that you will find other people that are helping you become better speakers. So these are like native speaking practice partners. And again this idea of a team, it’s so important, especially as I’m going to be releasing this guide very soon about how to meet native speakers. Because a lot of students want to get everything from one person or from one source. And it usually just, it just doesn’t happen like that. And it shouldn’t happen like that, because again nobody is going to be an expert at all of these different things. So what I always recommend is that you use native English speaker for just regular conversation. Because a lot of them won’t be able to know the answers you know, that, to how a grammar point works, and people aren’t, they just aren’t trained to answer those kinds of questions. Even a lot of English speakers that are teaching the language won’t be able to answer them. So even though you want to be corrected, and you want people that will help you do that, you need to find, if that’s important to you, you need to find somebody that can be a part of your team that can help you with that. And you focus on, okay am I saying this right? Can you help me with my pronunciation, that kind of thing. You put members on your team that are helping you with those specific things. So in my case uh, I have an accountant and I have uh, maybe like a sales person. Uh, and I don’t ask my sales person questions about accounting, because that would not be the best person to ask, and that would be kind of annoying to the sales person. But if I ask the sales person lots of questions about sales, and I want to learn things, and I’m excited, the sales person is going to be really, really excited to talk with me about that. So as I’m releasing this guide, this is something I really want you to think about. Do not go out and try to meet native speakers and immediately ask them, hey how do I pronounce this, and how do I say that? A few questions are okay, but in general what you’re looking for is a team of people that you can just relax and have conversations with. Because that’s what a native speaker is looking for also. Don’t try to get everything from one person. Build your team. Find other people like teachers that enjoy teaching grammar and ask them questions about things. And find other people that are interested in pronunciation that can help you with that specifically. But for looking for native speakers you want to go out and find people that are just interested in enjoying the language with you. You don’t have to work about making mistakes, these are people that you become friends with, and then that will be kind of the speaking practice part of your team. So whatever your team is, again design it, it can be a small team. It can be a big team if you want to learn lots of things, but get out and connect with people. And my guide will show you how to do that very soon. 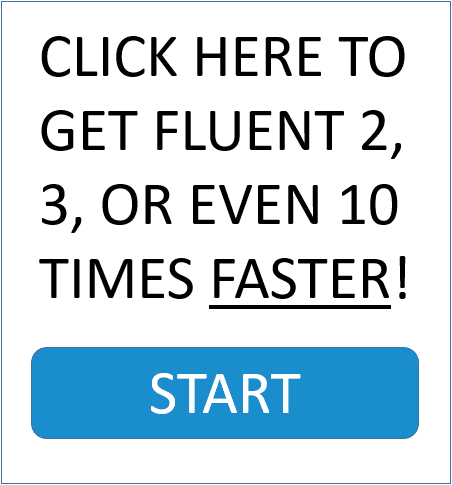 But if you’re really serious about getting fluent begin with the end. Think about the kind of day to day life that you’d like to have. How will you be using your English? Who will you be speaking with? And then from there you can start building your team of books, and audios, and videos, and real people that you get to train with. Well I hope you’ve enjoyed this episode of the Power Learning Podcast, we’re getting closer and closer to the end of the full year of training that members are having with uh, Master English Conversation, the four scholarship winners. And I’m really excited to reveal their progress at the end of the full year. So I hope you’re looking forward to that as well. 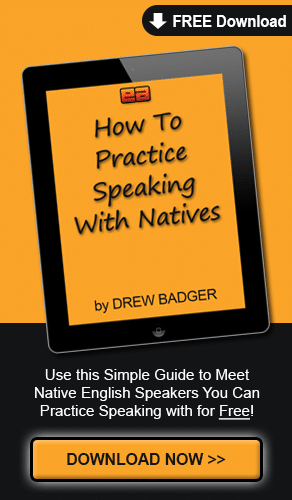 We’ll have more tips about practicing, and I’m so excited very, very soon to be releasing this guide for how to meet native English speakers to practice with. It will be life changing for many people, because many people continue to think about meeting native speakers in a specific way. And it’s really, really frustrating, so being able to meet native speakers, once you learn how to do that they are everywhere. You will find them everywhere. You will know how to talk with them, how to begin conversations with them, and then how to over time grow a relationship into a deep friendship that will help you uh, again make a strong member of your team and become a true friend. And that’s what I’m really excited to do. So if you’re listening to this, and it’s kind of the middle of October when I’m releasing it, you have that to look forward to. But also uh, if you’re listening to this many years in the future come to Englishanyone.com and you will be able to get the guide there. Have an excellent day, get out and think about your goals. Begin planning what your team is, and if you have any questions feel free to comment down below. Have an excellent day, and I’ll see you next time. Bye bye.